This is the fifth of six reviews of Bulgarian wine this month, and the last of two by Bessa Valley Winery. Those wines by Bessa Valley are the 2008 Enira and this 2006 Enira. 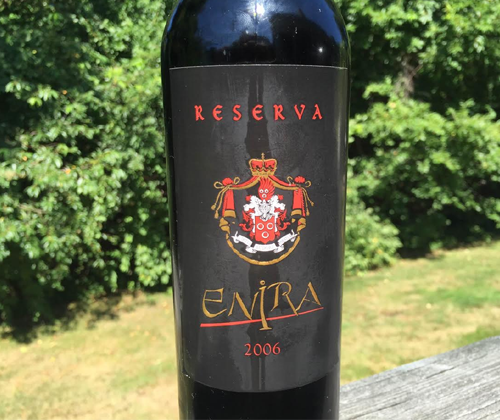 The 2006 Enira Reserva is 73% Merlot, 12% Syrah, 10% Cabernet Sauvignon and 5% Petit Verdot. It saw sixteen months of aging in French oak. I've been obsessed with the Red Hot Chili Peppers' new single Dark Necessities for like a month now so this review of my most beloved dark necessity will be written to the Red Hot Chili Peppers channel on Pandora. The most aggressive characteristics of this wine, in aroma and flavor, at this point in its life is raisinated fruits, licorice and menthol. There's also juicy tomato, the inside of an acoustic guitar, and fine black table pepper. 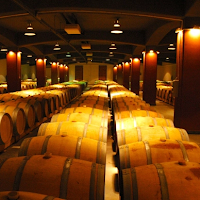 It has sweet tannins and a creamy full body, but it's so silky smooth that it can feel light as a feather. I kept taking sips just to feel it. On the finish there's menthol, it gains a tart cherry flavor and the tannins turn up the heat drastically. Sweet on the nose, elegant on the palate, strong on the finish. Seriously, yo. This is some goddamn impressive vino. Hands down the best I've had from Bulgaria yet. It's usually $40 but, at the time of this review, it's on sale for $30. I suggest you take advantage of that sale and get yourself some!